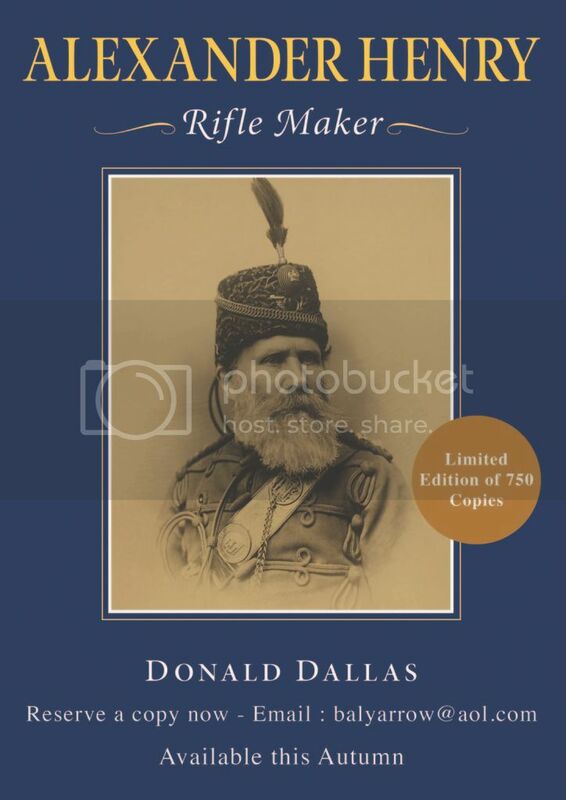 New book by Donald Dallas, Alexander Henry Rifle Maker, limited edition 750 copies. With contributions by me, Alexander Henry's great great grandson. reserved mine already. Write to Donald and he will answer and put you down for a copy. I had heard that he was working on an A. Henry book. Hope he has good information on the take down falling blocks. I sure would like to know more about how mine came about and I probably should have contacted him on it. Contact Donald to reserve and for other pricing info incl delivery. Well, it helps give it some exclusivity. Loc: Hunting classic Indian game! Eagerly awaiting my copy, my rifle is in the list on the back! The book arrives in Fife on Thursday 16th November! Early by a handful of days ! Thanks for the reminder. Just ordered my book from Donald. In the six weeks since Alexander Henry Rifle Maker was made available to order, over half of the 750 copies have been sold ! This is quite extraordinary, and has proved to be Donald Dallas' fastest selling book. I'm very pleased at how well the story of my great great grandfather's life and career has been received. The most interest outside of the UK has been in the US and Australia, but also Canada, Norway, Sweden, Denmark, Hungary, South Africa and New Zealand. I enjoy the book Richard. I am in process to make the book a slipcase. Great - glad you like it.